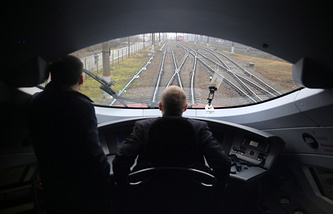 The Russian leader confessed that he had not "travelled yet on trains in China"
MOSCOW, June 7. /TASS/. Russian President Vladimir Putin expects a positive decision on cooperation with China in developing a high-speed rail system, he said on Thursday during a live question-and-answer session, answering a Chinese schoolboy’s question. "We are engaged in dialogue with our Chinese friends so as to implement one of our programs, which is the construction of high-speed rail connecting Moscow and Kazan. I expect that we will come to a positive decision and this will help strengthen and develop our ties with the People’s Republic of China," Putin said. The Russian leader confessed that he had not "travelled yet on trains in China." "I know that such a trip is scheduled for me and President Xi Jinping and I will be able to estimate China’s achievements in that field in the near future," he added.